This great home has the feel of a tropical paradise with its large yard and gardens, huge thatched-roof rancho, palm trees and gentle ocean breezes. The house has just been completely remodeled and updated with new windows, furniture and air conditioning. This home is best suited for families and couples. Please no single men need apply. Rate is based on two adults. It is located in Jacó's nicest neighborhood, Barrio Ricos y Famosos. It is quiet and safe, and yet just a short 10-minute walk from the center of town and an abundance of shops, restaurants, galleries, clubs, bakeries, ice cream parlors, etc. Let us help make your Costa Rican vacation a truly memorable experience! We can arrange tours and activities at discounts of 20% - 40%, recommend great hikes and spots to catch the sunsets or even arrange for fresh local foods to be prepared for you in the comfort of your home. With large fenced yard, rancho and swimming pool, this home is ideal for families. 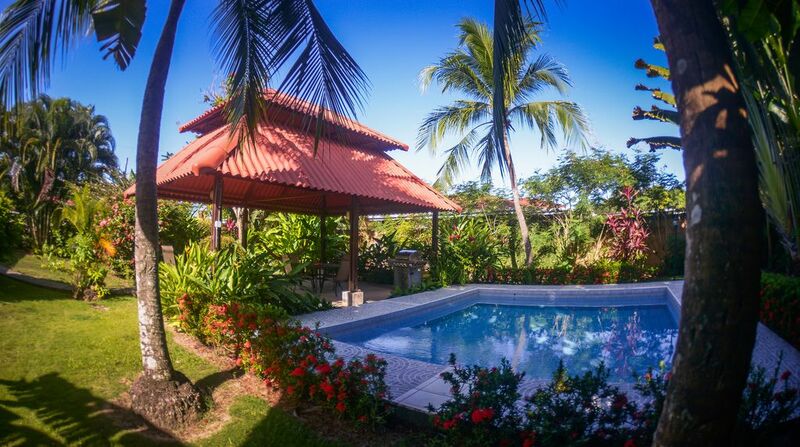 Please let us know if you have any questions about this tropical paradise, the town of Jacó or Costa Rica in general. Large thatched-roof rancho out by the pool is refreshing spot to rest in the hammock or enjoy meals. Large yard and gardens, palms trees with pipas and a great private pool. Separate seating are and table on the covered patio along the house. This house is everything we expected and more. It is a 15 mins walk from the beach; close enough to the beach, but far enough from the noise of the main strip. A/C in each room worked fine. Yard / pool is very private. Pool was great to cool down after long days at the beach. BBQ / washer / dryer / refrigerator also worked well. Unrelated to the house: Electricity was down only for 15 mins on Sunday morning during our 6-day stay (March 5-11, 2019). P.S. : Vivian (owner) and Rebecca (on site) we very helpful, effiicient, courteous and available. We stayed there Feb 2019 and had a great time. The house, pool and grill were great. Spent most of our days by the pool. The only reason I didn't give it a 5 was the bedrooms had ac but the livingroom and kitchen did not. Also it was a bit farther from town than I thought but we rented bikes and it took only a few minutes to get to town. Rebecca was great she answered all our questions and gave us good advice. Yes we would go back again had a very relaxing and enjoyable time. Thank you, George! It was great hosting you and your family as well and you are welcome back any time at all. Yes, the living area and kitchen do not have a/c as to acclimatize people for the heat in Costa Rica, but there are ceiling fans. The walk to town is about 12 minutes and to some, that's a long way, but to us, it's close...lol I'm glad you enjoyed yourselves and rented bicycles....it's a great way to get around Jaco. Yes, Rebecca is an amazing manager, thank you for that and I will pass on your compliment!!! The property is the best you’ll find in Jaco and surrounding area. The details are what make the difference, we felt very much st home with all the amenities and comforts we could hope for. The beds are comfortable, the kitchen well-supplied, excellent quality appliances and good size bathrooms. The couch is so much more comfortable than it looks, there are ample supplies of towels as well. The garden and pool are maintained super-well with regular maintenance during your stay; the roofed outdoor space was our hangout for the length of our stay, so many birds, so many fascinating leaf-cutter ants (completely non-invasive). The 10-minute walk to the beach is well-worth the privacy and sense of seclusion you experience on the property. Our host Vivian went above and beyond to ensure we were comfortable, happy and with a wonderful list of things to see and do. We were in regular contact which was unexpected and lovely. Rebecca, who tends the house, is sweet as can be, very thorough and puts much love into her work. You can feel the care and energy that goes into this property the moment you set onto the grounds. An oasis in a rather... unusual town. Tesoro Escondido is exactly as described and pictured. Vivian and Rebecca are delightful to work with, very responsive and thoughtful. It's definitely good that the bedrooms have air conditioners, but if we weren't sleeping or somewhere exploring, we were very content to be relaxing (or eating) in the Rancho or in the pool. We did have a problem with the air conditioners one day, and it was quite remarkable how quickly Rebecca had the technicians there to get them going again. Thank you for the opportunity to stay in such comfortable surroundings. We had a little trouble finding the place initially, but I guess I should have gotten directions prior to arriving in Country. Once we got the directions and met Rebecca at the house everything went smooth. The house and grounds are beautiful and just as advertised. Only the bedrooms have AC, but because the weather was mild we turned off the AC's and opened all the windows to have a natural breeze. This worked out well except for a neighbors dog that decided he would bark at all hours of the night and non stop for several hours starting around 5am. The house is in a perfect place if you have a car/golfcart/bicycles, we had a car so getting around was easy. Vivian gave us some areas to visit that is off the beaten path and we thoroughly enjoyed those trips. The property and the town of Jaco were exactly what we had hoped..The owner of the property was very friendly and we recommend to anyone wanting to feel the "Costa Rican" way of life, this is the place for you..!! We offer our guests discounts of 20% - 40% on many local tours such as Rainforest Tram, canopy zipline, crocodile river tours, sailing, kayaking, snorkeling, massages and more! Until confirmed, rates are subject to change without notice. Rates are based upon 2 people. Each additional person pays $15/day, $50/week, or $125/month. Low season May - Nov High season Dec - April Peak season Christmas, New Year's and Easter. Special rates apply for peak season - $200/night, $1100/week.